It may seem unbelievable, but Mexico has a long history with wine. In fact, the oldest known winery in North America is located in Coahuila, Mexico. It was established in 1597! It’s not just beer and Tequila to drink with tacos. 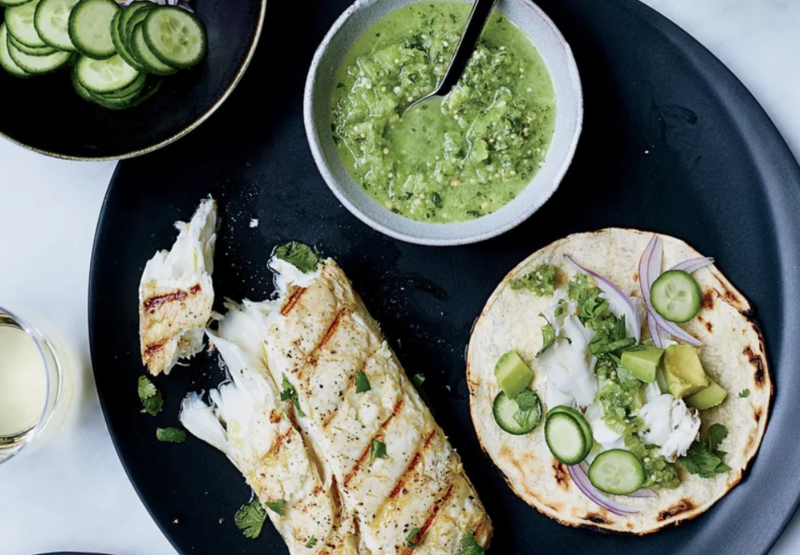 Warm corn tortillas with meaty charred halibut and aguachiles, a brilliant, spicy, tart salsa. In a blender, combine all of the ingredients except the salt and puree until nearly smooth. Season with salt and transfer to a small bowl. Heat a grill pan. In a large baking dish, whisk the lemon juice with the olive oil, cilantro, and garlic. Add the fish and turn to coat. Season the fish all over with salt and grill over moderately high heat, turning once, until white throughout, 6 to 8 minutes. Transfer the fish to a platter and flake into large pieces with a fork. Serve in warm corn tortillas with the salsa, avocado, red onion, and cucumber.